Are you all hanging on out there? With all the holiday parties and gift-buying and sugary sweets, it’s easy to get worn out. I think I’ve made it abundantly clear lately (sorry) that I’m on the worn-out side myself. I’ve resolved to focus on top priorities and let the rest slip, starting with my first yoga class in weeks tomorrow morning. I also want to hire some help so I can take a proper post-cookbook vacation next year. India? Morocco? Thailand? I’m bummed that I haven’t been able to share all of the holiday recipes on my list this year. I might try to squeeze in a few extra if I can be more brief in the introduction. What do you say? I know we’re all busy this time of year. I really wanted to revisit this gingerbread pancakes recipe that I published almost four years ago exactly. It’s one of my favorites. I’ve just been reticent to promote these pancakes because they looked like unappetizing brown blobs in the old photos. Here are some better photos to do them justice, along with a revised recipe that meets my post-cookbook recipe-writing standards. I also added special diet notes, so these should work if you’re vegan and/or gluten free. 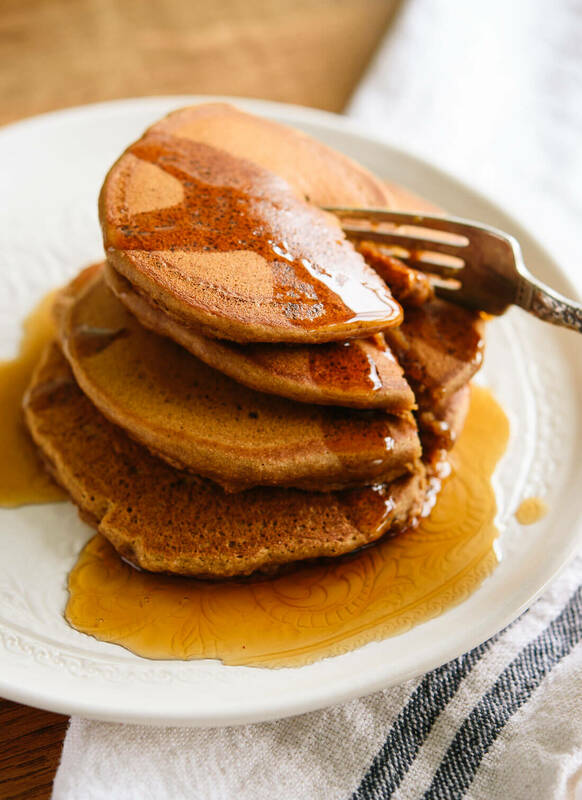 These molasses-laced spiced pancakes are fluffy yet hearty, and both warming and comforting. They’re for Christmas morning and special occasions, but they’re also for those other days when we need some warmth and cheer. I hope you enjoy them on a cozy winter morning soon. In case you’re craving more gingerbread-flavored sweets, check out my gingerbread granola, spicy molasses cookies and gingerbread cookies. 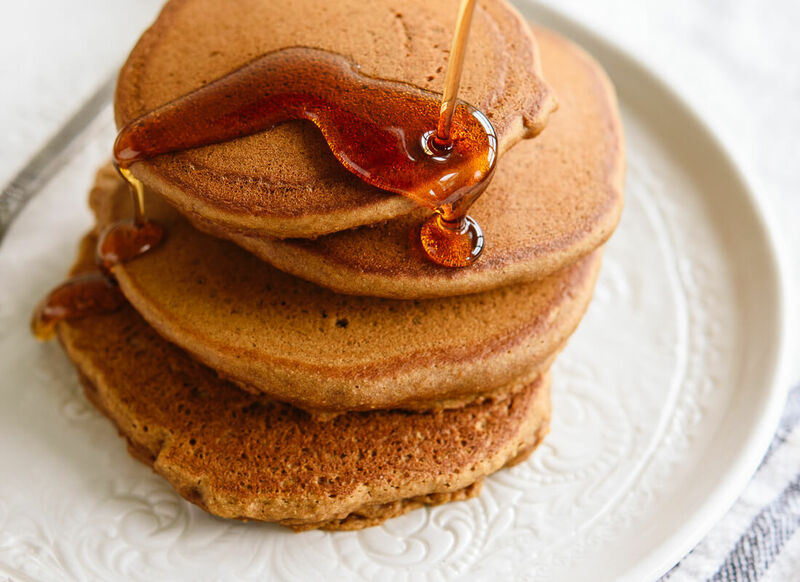 Fluffy, comforting whole wheat pancakes flavored with ginger and molasses. I love to top mine with maple syrup and a dollop of almond butter or, if I’m feeling decadent, a dollop of orange cream cheese*. Yields 8 medium pancakes, enough to feed 2 to 4. If you’re using an electric griddle, go ahead and preheat it to 350 degrees Fahrenheit. In a medium mixing bowl, whisk together the dry ingredients: the flour, baking powder, ginger, cinnamon, nutmeg and salt. In a smaller bowl, combine the milk, egg, molasses, maple syrup, butter and vanilla extract (if you’re using coconut oil and it solidifies on contact with cold ingredients, just warm the mixture in the microwave for 15 to 30 seconds, until it melts again, or let the mixture rest for a few minutes in a warm place). Whisk until the mixture is thoroughly combined. Pour into the flour mixture and stir just until the mixture is incorporated and no big lumps of flour remain. If you’re not using an electric griddle, heat a stovetop griddle, cast-iron pan or non-stick pan over medium-low heat. It’s hot enough when a drop of water sizzles against the pan. If necessary, grease the pan with a pat of butter or non-stick cooking spray (my griddle is non-stick so I didn’t use any). Give the bowl one more stir and pour ⅓ cup batter into the pan (if at any point the batter becomes too thick, just stir in a tiny splash of milk). Wait until the outer ½″ of the pancake is no longer shiny, then flip it with a spatula. Cook on the opposite sides for 1 to 2 minutes, or until golden brown. Serve the cooked pancake immediately or keep warm in an oven set to 200 degrees Fahrenheit. Repeat with remaining pancakes, adjusting heat as necessary to achieve pancakes that are cooked through and golden brown on both sides. Recipe adapted from my pumpkin pancakes recipe. Make it dairy free: Use your favorite non-dairy milk and coconut oil instead of butter. Make it egg free: I’m pretty certain that you can just omit the egg, since this recipe is so similar to my simple vegan pancakes recipe. Please let me know if you try! Make it vegan: Use your favorite non-dairy milk, coconut oil instead of butter and skip the egg. 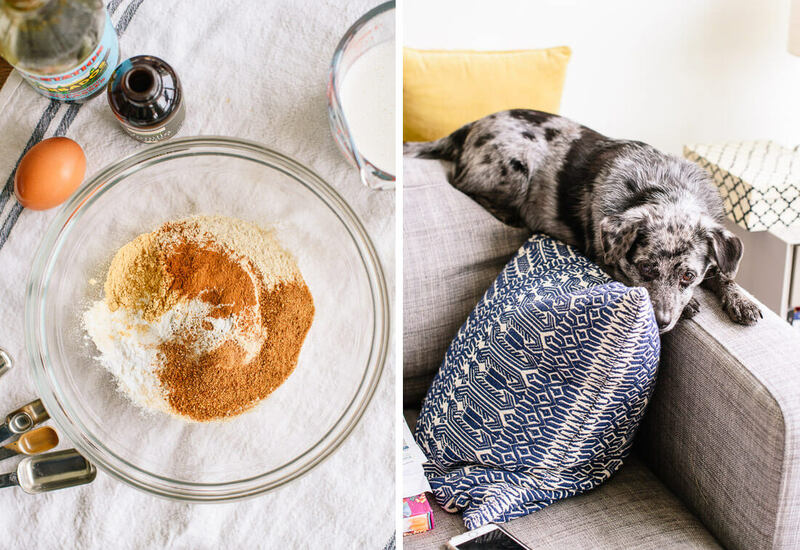 Make it gluten free: I think you can successfully use all-purpose gluten-free flour here. Please let me know if you try! I would call this anything but humble…they look gorgeous! Hope you two love the pancakes! He deserves a good breakfast after all that cafeteria food, yuck. Maple peanut butter sounds awesome. I’m partial to almond butter with molasses-sweetened things. Something about it is so right! I’m totally with you, pancakes are my comfort food for sure. Like clockwork, when I’m experiencing a no good, very bad morning, I crave a pancake, make a batch and feel comforted almost immediately! I do that! Just add the frozen pancake to the toaster, toast like bread and you’re eating in under 2 minutes. I thank myself every time I hit that stash! I love the translation of a cookie into a pancake! I too had issues with adjusting to a gas stove, I am a huge fan now, bu coming from electric it was a switch. I had a gas stove in my last apartment, but this one is smaller and the knobs only have indicators for “medium” and “high”! It’s tricky. Looove this idea! These pancakes look as good as they sound! what a fabulous idea!! pancakes are my favorite dish too! now I have to decide between this and the pigs in a blanket idea I saw (sorry I forgot the website) where you place a breakfast sausage inside a pancake and cover it in maple syrup. I’ve been seriously craving pancakes-for-dinner lately and what better recipe to get me in the spirit of the holidays! Eddie and I decided to make these for dinner – you a rock star, lady! We LOVED them. I mean, who doesn’t love pancakes for dinner… but these were amazing. Totally going to make these for the fam on Christmas morning! Sinply divine. That orange cream cheese is calling my name! There’s something about gingerbread and citrus that just go so well together. The pancakes look amazing, and I love the addition of the orange cream cheese. Citrus can always lighten up an otherwise heavy dish. Perfect pancakes! 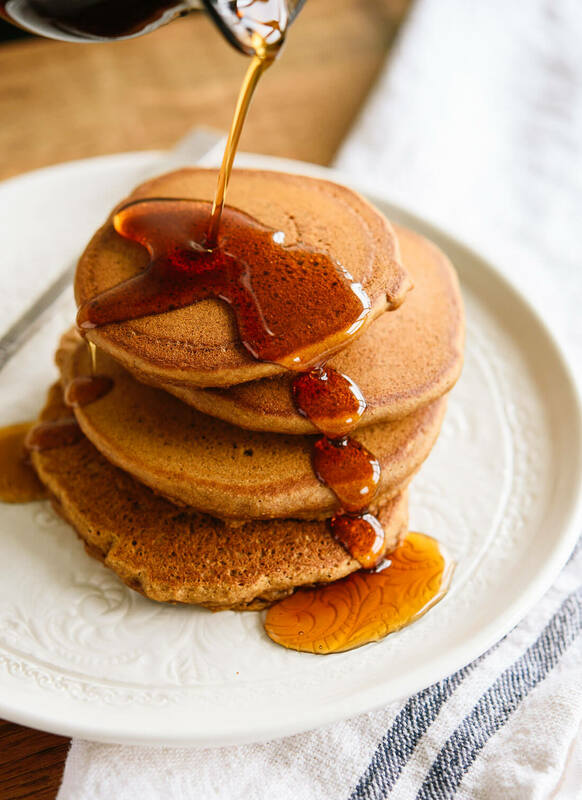 I love gingerbread spices and the idea of that warming mix in these pancakes would have me springing out of bed in the morning! Thanks for the wonderful recipe! My family just finished our breakfast and we all enjoyed it. I added blueberries to it as I think gingerbread is better with them (thanks to James Beard for the tip). I used olive oil as I do not eat butter and had fat free cream cheese plus sugar free syrup as a family member is diabetic. We will be eating this again. I made them as well today and almost added blueberries…now reading your comment, I for sure will add them next time. They are delicious!!! yum! those look like the perfect Christmas morning breakfast. All I need is a bloody mary to go along with it! Thanks for the recipe! Mmm. These look like the perfect Christmas miracle. 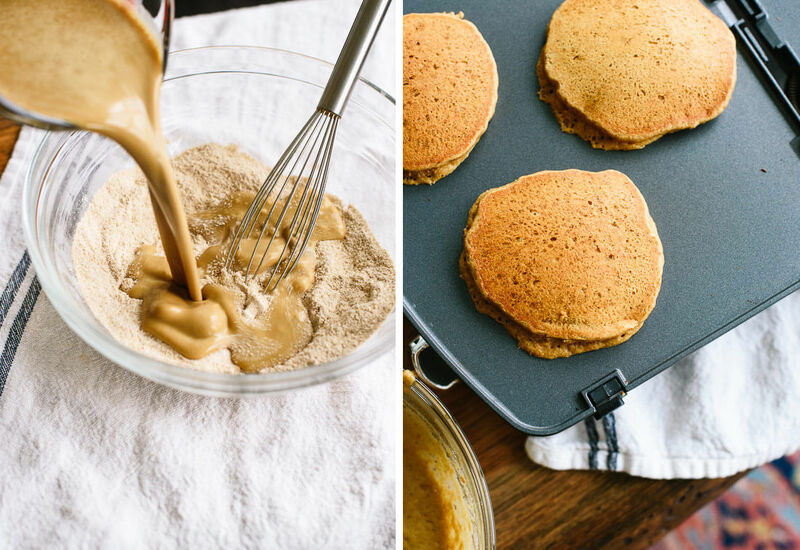 My kids are pancake fanatics – I’m going to have to try these out this weekend. I imagine these would smell heavenly as well from the gingerbread spices, a nice way to start the day. We had these pancakes for dinner tonight with a fried egg and bacon. They were delicious, even without the cream cheese topping. This recipe is a keeper. “AAAW YES.” That’s what I was saying in my head when I read the title of this post and saw that first photo. I think a little sweet and spicy comfort has been extra needed for all of us lately. Good call, lady. These look wholesome and perfect. Thanks, Quinn! I’m so glad to hear you’re enjoying my recipes and happy to hear that your mom loved these pancakes. I’m making them again for my family on Christmas morning! These pancakes are DEFINITELY worth waking up to. You know, I’m a pancakes kinda girl, and anything gingerbread-y is my thing. Have a happy holiday my friend! Kate, thank you so much for posting this recipe – they were perfect for our Christmas breakfast! Merry Christmas! Made these this morning..they turned out great; thank you for this recipe..! I am eating these right now with fresh raspberries and maple syrup with a wee dusting of icing sugar. First attempt at pancakes. OMG. Hope this recipe lead to many more homemade pancakes, Whytney! Pancakes are the best. Oh yeah I forgot to mention, it was my first attempt ever at making pancakes. I found a new love!!! That’s so awesome, Sarah! I’m so glad you and your family has been enjoying the recipes. Thanks for letting me know. Come visit me in KC again! absolutely delicious. I made this for breakfast yesterday and topped it with fresh fruit. Thanks, Jaycee. I’m glad you enjoyed the pancakes. Hey Daniella! Sorry for the super delayed response. I suggested against using blackstrap just because of the flavor intensity; I thought it would be too strongly molasses-y for most. If you love molasses flavor, though, go for it! Thank you, Jeff, that’s really nice to hear. Hope you love the pancakes (I think you will!). 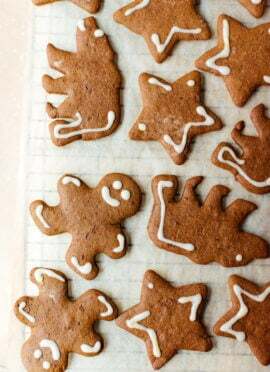 I love gingerbread anything, and the addition of whole wheat flour makes me want to eat them more! I have a gingerbread waffle recipe that I love, but sometimes waffles are too heavy. This is the alternative. They look fabulous! Wow – I have never seen my 3yr old son eat ANYTHING as fast as these pancakes! We didn’t do the fancy cream cheese thing – just the pancakes and syrup. He didn’t even stop to put syrup on them! We used the gingerbread man cookie cutter – large one – to make them into an even cuter version! He ate 3 and I’ve never seen him eat that much food at one time before! Thanks for the great comment, Donna! I’m impressed that your son enjoyed molasses pancakes. I made these for my family on Christmas morning and my younger brother told me to “never not make pancakes this way again.” Ha. Your gingerbread cookie cutter idea is just too cute! Love love LOVE your blog. I’ve literally been doing a recipe a week and I’ve been having so much fun! As a vegetarian, it’s been just a great find. Just a quick question: could you recommend some good egg substitutes for things like these pancakes or cookies? I tried using banana in pancakes once and they tasted good but didn’t really hold together very well. Thank you! Thank you for commenting, Ari! To tell you the truth, I haven’t experienced much with egg substitutes. I think you might have good luck with flax eggs, though. 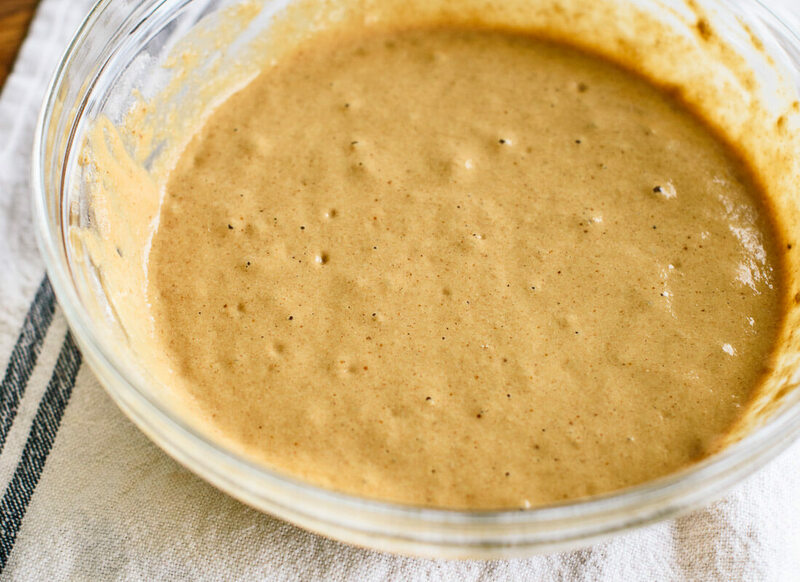 Flax eggs are just ground up flax seeds mixed with water to create a binding slurry. I’m sure you could google it and find out more details. these are fantastic! It’s been dreary and grey here so pancakes, specifically gingerbread pancakes, seemed quite fitting. I mixed the dry ingredients ahead of time and stored in a mason jar (something I’ll be doing more often of) and even mixed the wet and stored in the fridge overnight. Melted coconut oil the next day, mixed them, and wowed the fam :) I couldn’t find my powdered ginger so I used crystallized. The flavor was there but the crunchy, sweet/spicy bits in the cakes was one of my favorite parts. Next time I’ll probably add zest to the mix. Thank you for another keeper!!! Thanks, Jen! So glad you enjoyed the pancakes. These pancakes look delicious! Could you please come up with a healthy gingerbread muffin recipe. My girls love gingerbread, but all the supposedly healthy recipes online have FAR too much added molasses and sugar. Hi Kristin! I’m sorry, I just found your request. I’ve added gingerbread muffins to my list! In the meantime, I love this hearty molasses bread, which isn’t too sweet and could probably be turned into muffins. Gingerbread pancakes always smell heavenly while cooking. We love them with homemade applesauce on top. I’ll try your recipe soon. Thanks, Jan! I hope you love them. Just made these this morning…for the third time this holiday season. So delicious. Blackstrap does give them an intense flavor, which I love. They are fluffy and satisfying. I’ve made them exactly according to your recipe and I’ve also used a blend of gluten free flour and almond flour, and used homemade cashew milk. So those ingredients work well, too. Thank you, Lisa! So glad you’re enjoying these. I was out of milk when I made these so I whipped up some cashew milk like you did! Thank you so much, Susan. I wish that I weren’t dealing with so many deadlines right now, so I could spend more time on the blog! I appreciate your support. Hope you enjoy the holidays, even if you don’t make a big fuss for them! These look so yummy! I’m personally more of a waffle person, if I used this recipe and put it in a waffle iron would that work too? Hey Sarah! Waffles are a little different; they need more fat in them to crisp up. I have a gingerbread waffle recipe on my list for February, I think. If you have a favorite waffle recipe, I’d probably use that recipe and add the molasses and spices used here. Oh my goodness, my kids are going to LOVE these. Thanks for the great recipe. Can’t wait to try them. Thanks, Esther! Hope you all enjoy! May, my birth month…What a treat I will give to myself with your book. I wish it were my Christmas gift but will have to wait for my birthday. Oh, and these pancakes are delicious, just as all you make. My nephews and son say I’m the best chef on earth, so a big thanks to Cookie!!! I tell them that my chef mentor is Cookie, a friend of Brownie, our dog. I’m so making these delicious yummies on Christmas morning! I’ll sub the whole wheat flour for a cup of Pamela’s pancake and baking mix and omit the baking powder. Woohoo- can’t wait! Hope they turn out fabulously for you! They are delicious, and so happy you made them suitable for vegans, too! I don’t often have breakfast with pancakes, it feels like a very American thing for me to do, but I am definitely starting to see the appeal of it haha. And I love reading your updates on the cookbook and your life, so don’t apologise for that, please! I can imagine you’re very much done with it, though, and now that I’m thinking about it, suddenly the release of your book doesn’t feel that far away anymore… so exciting! I’m eager to see what the final cover will be, too. As for your trip, I had to think of Italy, because I love that country, and the way they cook and handle food and ingredients. It’s so fresh and simple yet bursting with flavours, it reminds me of your food, too. The islands (especially Sardegna, to me) are stunning, and there’s so much history packed in the splendid cities and little villages. I live in the Netherlands, which is much tinier and maybe not suitable for a weeks- long holiday, although a couple of days visit to Amsterdam is definitely worth the effort if you happen to be in Western Europe. Hi Evelyn! I really do love pancakes for breakfast; they always make it feel like a party. The book is becoming so real now as the design and final edits are wrapping up. Oh, I can’t wait for you to see it! I have been to Italy (Rome, Venice and Florence) back in college, when I had very little money to spend on food and picky taste buds. I need to go back and do some research! :) I added Sardegna to my list, too. I’ve always wanted to go to Amsterdam. Glad to know where you live, I’ve wondered! Happy holidays! Yeah, breakfast here is often consumed when I rush out of the door, but in the weekends it’s nice to make an extra effort! I’m very excited for the cookbook, too, and it’s funny to see most people liked cover #2, I loved that one the best, too. And the cities are marvellous, aren’t they! I think you should definitely go back for ~research~ purposes, haha. I’m excited to read Amsterdam is on your bucket list, too. It’s not per se a foodie’s must-go (although the food is really decent, it’s just not it’s signature, like with Italy), but to me, the city has this friendly, laid-back vibe, and the water everywhere, the little bridges, the crooked houses, all the cafes and shops and markets and all within walking distance, really give it something special and cosy to me. Thank you, and happy holidays for you, Cookie, and your family, too! Thank you, Abby! Hope you get to relax and enjoy the holidays. xo! Ooooh, would have never found this if you hadn’t reposted! Thank you for sharing, looks incredible! Glad you found them now! Happy holidays! These were so good. Very light considering they required whole wheat flour! Thanks! I’d take a picture but mine weren’t nearly as pretty as yours! Thank you, Karen! Happy to hear it! These pancakes are DELICIOUS!! !We just made them this morning. But i want to know the truth – isn’t Cookie the real brains behind these recipes? She just dictates the steps and uses you for your primate hands, right? Well, tell her she’s brilliant! Made these this morning. Amazing and delicious. A big hit with the whole family (kids 4 and 6) and husband. Thank you!! I was looking for a low sugar gingerbread cake recipe to serve my girls for breakfast. A friend suggested I try using your pancake recipe. I doubled your recipe, and baked it in a 9 x 13 pan at 350 for 25(or more) minutes and it worked! My girls loved it! I love having a new recipe for our breakfast rotation. Wow, I’m glad that worked! I’ll have to give it a try. Thank you for sharing! We made these yesterday as a test run for Christmas breakfast. I had “white whole wheat flour” on hand and used that, with melted butter and maple syrup where the recipe offered alternatives. DELICIOUS!! And so quick and easy! Served with fresh strawberries and sliced banana, along with maple syrup. Will add a sprinkle of powdered sugar for Christmas morning. I discovered your blog earlier this year and have enjoyed a number of your recipes…every one has been a success. I preordered your cookbook and look forward to it! Thank you so much, Cathy! So glad you loved this recipe and the others you have tried. And thank you tremendously for pre-ordering the book. Happy holidays! Thank you, Laura! So glad to hear it. Happy holidays! To turn the pancakes vegan, what would you recommend instead of the egg? A banana? Applesauce? I know Chia and Flax seeds are apparently good, but I’m trying to look for something more common. Hi Morgane! Check my recipe notes; I have suggestions for you there. :) It’s actually entirely possible to omit eggs from pancakes and waffles (as long as they’re not gluten free), since so much leavening action takes place automatically when the batter hits a hot pan. Pancakes turned out really well, though would caution others against using coconut oil for the batter. Because you’re mixing it with cold ingredients, the coconut oil (even if you’ve already melted it) will solidify and mixing becomes a pain. Will definitely be making again, next time w/ good old fashion butter! Sorry about that, Hannah. I usually provide a tip on what to do if that happens so I’ll add it now. You can just let the batter rest for a few minutes in a warm place, or just warm the batter in the microwave for a few seconds. 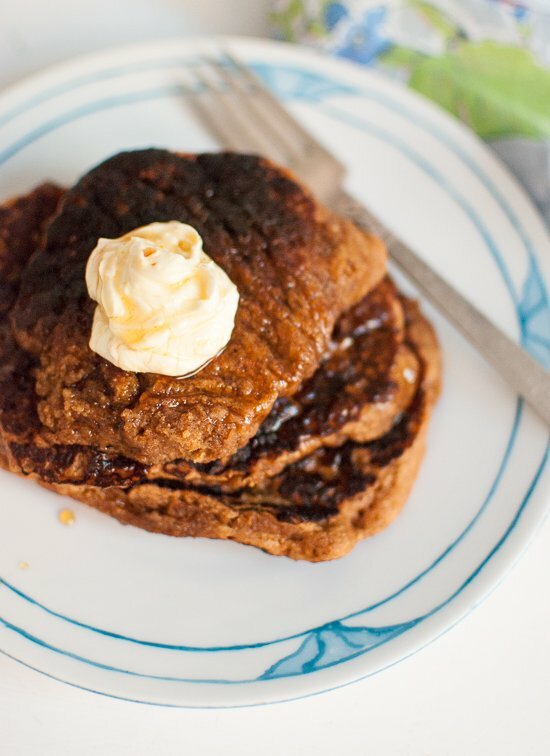 Oooh, I love the addition of molasses and this twist on pancakes! Thanks for the great idea. This stack looks like the PERFECT post-Christmas breakfast. I have to try the vegan variety of this recipe! Excellent recipe! We served them with a choice of toppings: maple syrup, triple berry compote, meyer lemon marmalade, and homemade applesauce. They are also perfectly delicious plain. Thank you for creating a recipe that was light and perfectly spiced for the season! thr wheat flour was more overpowewring than the blackstrip molasses. I want to try it with white flour & brown sugar instead of maple syrup. I tried this recipe without the egg and it worked out great! They were really delicious. Thanks for another great recipe! Hey, Olivia – happy to hear your variation worked well. Thanks! 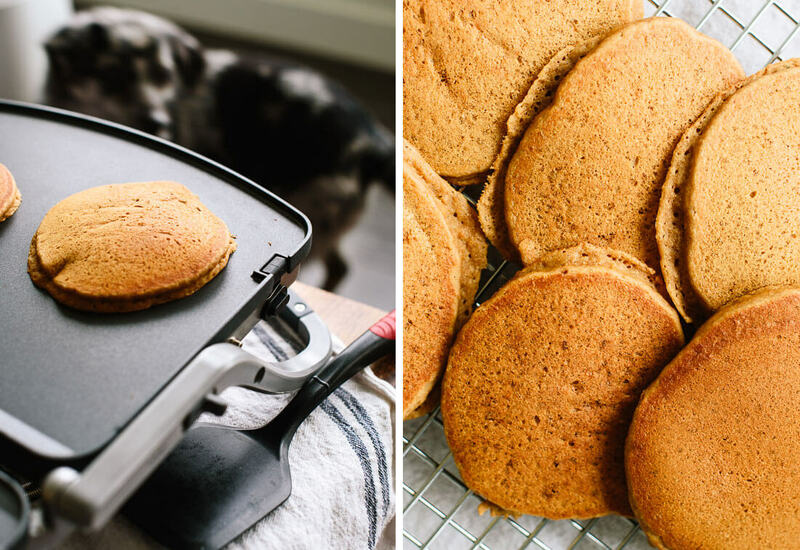 How have I never seen a recipe for gingerbread pancakes before? These are delicious! We’ve made these very weekend since this post and aren’t stopping anytime soon. My chef husband appreciates you mentioning how strong blackstrap molasses can be. We served them with whipped creme France with some more grated nutmeg and diced pears. Sooooo good. Ooh, the diced pears sound *amazing* with these. And I’m glad it is chef-approved, to boot! hi Kate can i ask which brand of vanilla extract do you use? Hi Jocelyn, I use Frontier Co-op these days. 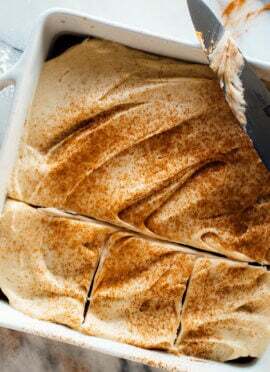 I absolutely adore this recipe and its on my list as a holiday gift or favor option to create a mix of dry for this to give to all my friends to enjoy. I’ve made these twice now and each time, I’m in heaven. Thank you for all the amazing vegetarian/vegan breakfast alternatives! I love that idea! Thanks, Chandani! This is such a yummy recipe. My kids love it, and we have made it twice, and each time it comes out perfect..taste and consistency. I am thinking I will add some grated orange peel next time we make it. That is awesome to hear, Kristine! Thank you for your comment and review! Loved these pancakes. They were light and fluffy but still hearty and had the perfect amount of gingerbread spice. The pancakes were too thin. Are you sure your proportions in your recipe are correct? Deepa, are you at sea level? Elevation can really mess with any recipe that uses leavening agents like baking powder. If you add hot or boiling water to your baking powder, does it pop, bubble and fizz? If not, your baking powder needs to be replaced. In my experience, a tablespoon of baking powder, in a batch of anything, of this size, can hardly do anything other than puff up. So if it doesn’t, one of the above factors is likely at play. I’m sorry to hear that. Yes, I’m sure that my proportions are correct, as they’ve turned out great for me and other readers. 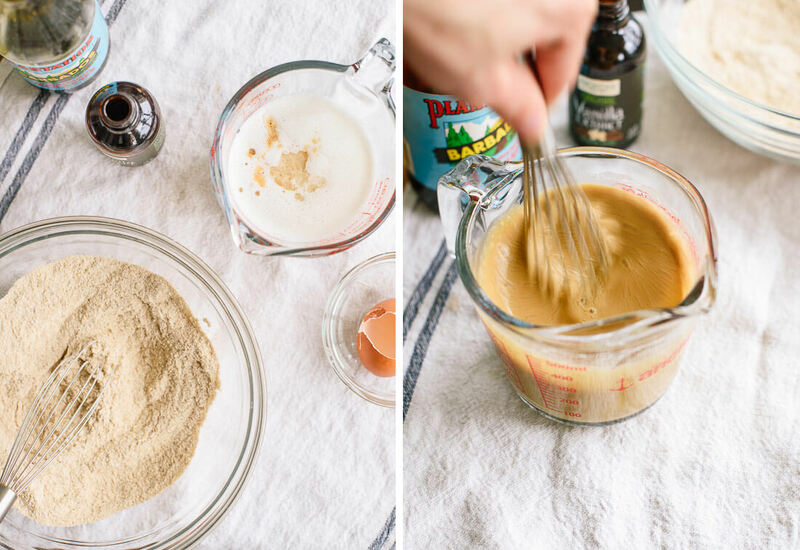 Are you sure you used 1 tablespoon baking powder, not 1 teaspoon, or baking soda by accident? Hi, I’ll try again! I think my baking powder needs to be replaced. Thank you for the tips. I haven’t made this again, but I did make your oat flour pancakes and they were AMAZING and fluffy! Made it vegan by subbing 2 Tbsp ground flaxseed and an additional 2 Tbsp soy milk, for the egg. Works well in a cast iron skillet with a bit of coconut oil (about 1 Tbsp will cook the entire batch). Also added a pinch of ground cloves to the spice blend. Waiting for the s.o. to finish up what she’s doing, so we can eat, but they smell amazing! I’m sure they’ll taste just as good; serving up with cashew butter and grade B maple syrup. Thank you, Taylor for sharing your adaptions for vegan! How did they turn out for you? They were AWESOME. Like, I’ve already added the recipe to my card box. The perfect balance of hearty and fluffy, not too sweet, and spicy. Thanks for sharing your recipes with the world! Wonderful!! Thank you for coming back to comment. Thank you, Lauren! I appreciate the kind comment and review. I just made these, and they are fantastic! We’re vegan, so I added 1 TBSP ground flaxseed to the milk and let it sit for a minute to thicken. It worked perfectly. The only problem I had is that they really stick to my cast iron pans, even with a fair amount of oil. I found that making them silver dollar-sized solved the problem. Thanks for another great recipe! You’re welcome, Melanie! Thanks for the review. We love your recipes in our house! I typically substitute ground GF oats for the flour but today I substituted Bob’s Red Mill GF 1 to 1 flour and that worked great too. I’ve tried several GF flour blends and that one is the only one that I trust to substitute in recipes. I’m glad that worked so well gluten free! Thanks for sharing that blend is your go-to Gordon! Holy, these are so good! I topped mine with some leftover cream cheese icing I had on hand, and washed it all down with coffee and Carolan’s :). The perfect thing on a cold winter morning. That sounds amazing! Thank you, Devan. They are Delicious!! 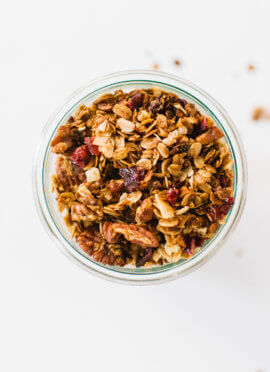 Just finished our Sunday breakfast and they were scarfed up by all…Doubled the recipe so that my daughter can heat up a few for a quick breakfast before school. Great to hear, Missy! Thanks for the review. Love the recipe!! But I thought that a whole tbsp of baking powder was too much so I opted to use just half a tsp and they still turned out amazing. Just curious, any specific reason you included all that baking powder?